This week, I came across a Time Magazine article written about animals and their ability to grieve…or as some would say, perceived ability to grieve. How appropriate, really, since I’m also going through a grieving process due to loosing my mother recently. The article was well formulated and the journalist took both angles, first showing the reader that animals do mourn when another animal dies, but also states what scientists explain for their observed reaction, which could be due to x, y, or z. 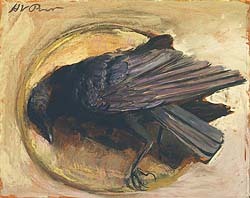 One fascinating example was that when a crow dies the other crows will cover up the body with twigs or other items. If one crow finds the body, soon it will call all the other crows, and they will gather around the body, almost holding a vigil for the deceased crow. However, the “scientific explanation” would say that they do this because of the smell of the decaying body. I am not sure I agree with them. Nor do I think that the writer of the article is convinced due to the many other examples of animals who mourn and grieve. A friend sent me this YouTube video of an unlikely animal couple. A blind horse and his goat companion. It is very touching. I wish the scientific community would watch, learn and be open to more of these types of stories. There’s no question in my mind that animals have feelings and are able to grieve the loss of a loved one whether human or animal. Especially after watching my friends dog after she passed away. The dog mourned for weeks after she was gone, just like a human would. The dog was depressed, lacked appetite for food, would not come out to play, and stayed in bed! Also, check out Barbara J. King’s new book! It is called “How Animals Grieve”. Here is a YouTube clip, where she talks about animals and their grieving process. I’m personally very interested in reading Barbara’s book this year! What are your thoughts on this subject? If you have an experience or story, please share in the comments! I would love to hear! One late morning, perhaps 15 years ago, I heard the loud sound of many crows and when I went to window overlooking the valley, I saw what looked like a tornado comprised of many hundreds of crows slowly rising and swirling from a place just south of us. I have never seen this many together before or since. The sound of them was almost deafening for about half an hour and then they were gone. Later that day I walked to the post office, and just a block south of my house I saw a dead crow by the curb, and I realized that I had observed something very special – a massive funeral ceremony. I have never looked at crows the same way again. I have so much respect for these highly intelligent and sensitive birds.